I think too much, I talk too little. 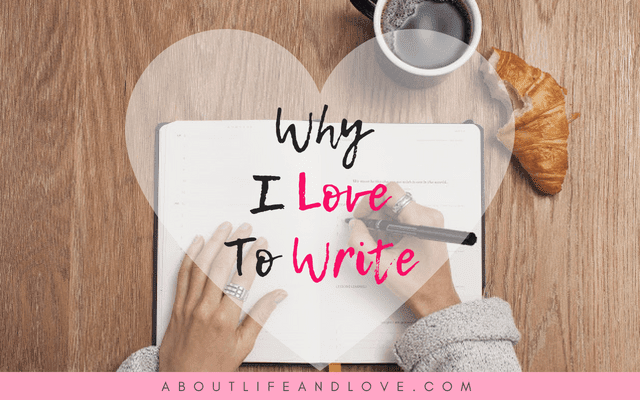 I have both selfish and selfless reasons why I love to write. I love to write because it's an escape from the world. In writing, I create a world of my own. I am in total control. I love to write because I think too much but talk too little. Writing helps me get some stuff off my chest and in a way organizes my messed up head. I love to write because I don't think I'm good at anything else other than putting words together to form an idea, a sentence, a story. I love to write because it keeps me sane. I love to write because the world becomes better with every word I type. I love to write because I may not follow every rule that grammar experts made, I can still convey my message. But as I write through the years, I've found a few selfless reasons that made me love writing more. I love to write because somehow, I help people feel they're not alone when they read my posts. I know how it feels to desperately seeking for help and enlightenment and not finding one. I wish someone had somehow guided me through those tough times with words of encouragement. I want to be a wounded healer. Through my writing, I can do that. I love to write. People may not always like what I write but that's okay. I can never please everybody and it has never been my objective to do so anyway. I write for myself, and I write for those who are interested to read my thoughts. Whether you like what you read here or not, know that I write here are from the heart. And that's all that matters. Love the message. All great reasons to write. Will share. Hi. Love this.. Have you heard of Chiron, the Wounded Healer? Great mythology. I write for the same reasons. It kept me sane all these years and gave me back my social life. Your blog is awesome btw. Much love from Dubai.